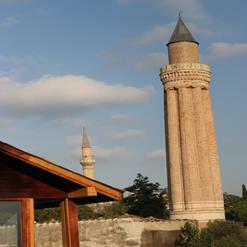 Built in 18th century, Tekeli Mehmet Pa?a Mosque is one of the most important Ottoman mosques in the city of Antalya. Located at the back entrance of the castle of Antalya, the mosque rises high up and is supported by three domes. Though the exact data about its constructions is not available, the building has undergone restoration two times in years 1850 and 1940.